Downey Daily Photos: Bump set spike! Here's another group of Sunday afternoon players. 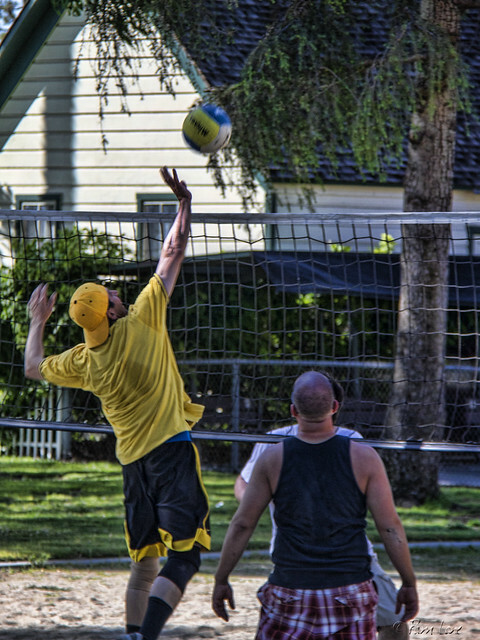 This time it was an informal game of volleyball on one of the sand volleyball courts at Apollo Park. The park was renamed to Apollo Park many years ago, in honor of the Apollo Space Program which has played such an important role in Downey's history. (Click here to see other Apollo-related posts.) Does anyone remember the park's original name? In the background you can see the back side of the historic Dismukes House. A great action shot! Thank your for sharing.